The patent pending ID Tag holder system is built right into your collar! Perfect for moving your dogs ID Tags to a different collar. No more broken finger nails or scratched ID tags. NOTE, this system is only for sizes Small, Medium, and Large. 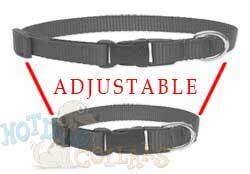 Other sizes will utilize a standard clasp. Adorable for my little white and caramel chi chi. It fits well and has no sharp edges at the buckle. our beautiful yellow lab, Abby, looks even more beautiful wearing her red aloha collar....aloha, baby! Love this collar. Quality is excellent. Very versatile and easy to get on and off the dog. Looks great! Bright red and clear white print looks great on my red poodle.